Shulton's introductory men's toiletries product line included shaving soap in a mug, after shave, cologne and talcum powder - all with the original and distinctive Old Spice scent. The bottle design was taken from a Colonial American era apothecary jar and was executed in heavy pottery, reminiscent of Early American Colonial dishware. The nautical theme was also inspired by Early Americana since shipping was a mainstay of Colonial American life. Working from this basic design, the Hull Pottery Company in Crooksville, Ohio, developed a number of wooden and pottery prototypes for product bottles. You can see from the pictures of these samples, executed in the mid-1930s, how the design and graphics evolved. These early bottles are stored in the archives of Procter & Gamble's home office in Cincinnati, Ohio. With an final design in hand, Hull Pottery set about making the pottery bottles for liquid and talcum products. The original bottles were fitted with a zinc/steel rim and a zinc stopper. As the success of Old Spice for Men grew, Shulton built a new plant in Clifton, New Jersey in 1946. The "modern" plant required closer tolerances than the Hull Pottery bottles could achieve. The irregularity of the neck openings created a significant number of leaky bottles. In the early 1940s Shulton turned to the Wheaton Glass Company, in Millville, New Jersey, to develop a cream-colored glass that would look like pottery. 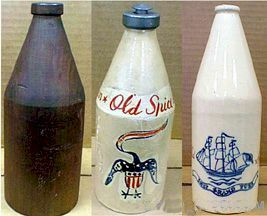 Soon Wheaton was the source for molded "pottery glass" shaving mugs and bottles, but the bottles retained their original distinctive shape. After Shave and Cologne bottles were identical, while the early talcum bottles (before shifting to a plastic shaker in the late 1950s) had a slightly steeper taper to the shoulder. Around 1948, the containers' appearances differentiated the product they contained. The Ship Mt. Vernon first appeared on the talcum container at this time and has remained there ever since. It is the only ship to appear sailing to the right! The Ship Recovery also appeared on the After Shave container about this time. Ship Recovery and Ship Grand Turk were used on both after shave and cologne for the next several years. These earliest containers all had metal stoppers, and the "p" in the word "Spice" has an open loop. By the mid 1950s, the loop in the "p" in Spice became closed. In 1956, the containers took on a new appearance. The unique silhouette of each ship remained on the front, but without their names below. Instead, the words "Old Spice" in script appeared beneath each ship. The Ship Recovery is on the Cologne; the Ship Grand Turk is on the After Shave; and the Mt. Vernon adorns the Talcum. The contents of each container (After Shave Talcum, After Shave Lotion, Cologne For Men) appeared below the words "Old Spice." Also about this time, the plastic stopper was introduced. Around 1959, a larger container of after shave and cologne were produced. Up until this time, the liquid products were 4.75 ounces, and the talcum was 3 ounces. A larger bottle of cologne and after shave became available - 9.5 ounces. Around 1967, the cologne bottle dropped the words "For Men." By the early 1970s, the volume of the containers was added to the front below the words "Cologne," "After Shave Lotion" or "After Shave Talcum." After Shulton was sold to American Cyanamid in 1972, and continuing through the 1980s, a number of Novelty Bottles were produced. Some collectors confuse these novelty bottles with Avon bottles, but they are completely separate product lines. In 1981 and through the 1990s, the Cologne product was "re-branded" as "Long Lasting Cologne."